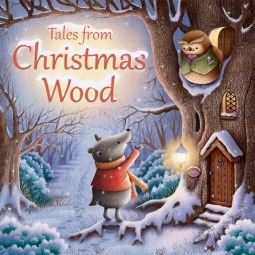 This book is a cute anthology of five very short stories about different animals who live in Christmas Wood. Each animal is looking for something, and each story has a lesson. Badger is bigger than all the other animals, and is having a hard time making friends. She asks the owl for advice, and while he feels ill-equipped to help her, she leaves very happy. The second story is about a mouse who made gingerbread for his friends, but somehow lost all of it in his tummy. He felt bad, but grandma always makes things better. The third story is about a rabbit named Rosie whose brothers are making it very hard for her to concentrate on making Christmas cards. She throws a tantrum and storms out into the snow, concerning her brothers and making them realize how much they love having her around. Then we have Robin, who loves playing make believe. He wants to be a hero more than anything, and Rosie the Rabbit gives him that opportunity. Robin realizes he does not have to he a super hero to be special. All the animals come together in the end for a festive Christmas Eve adventure. They each learn the true meaning of Christmas at a very festive Christmas party, with gifts, friends, and singing. My favorite thing about this book are the illustrations. They are adorable and so warm and cheerful. The animals have such sweet faces, and the illustrator is able to paint light in a way that reminds me of Thomas Kincaid (although simpler). I only wish the type had been given as much attention. A very generic font was used for the story itself, and the thin black letters get lost in the illustrations. I would have loved to see a more whimsical font and more thought put into the placement and size of the words. I also think there were too many words on a page. Perhaps this will be fixed before printing, though. All in all, I really enjoyed this sweet Christmas book. The stories all feel very short and disjointed on their own, so they should be read back to back in one story time experience. I would not recommend reading one a night unless your child is old enough to remember each one and tie them together in the end. I think it’s a great addition to any family’s Christmas book collection, and I know I’d love to snuggle in bed with my littles someday and read this cozy tale. Thank you for introducing me to TALES FROM CHRISTMAS WOOD! The cover art alone looks darling and the stories sound enchanting. My daughter is a freshaman in college, but we(myself included) are never too old to enjoy an endearing picture books like this!